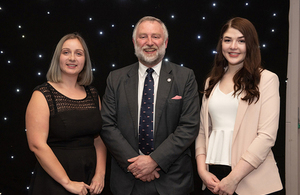 Sophie Prescott, UKHO Digital Marketing Communications Executive, has won in the ‘Career Development’ category at the Somerset Apprenticeship Awards, held at Haynes Motor Museum earlier this month. The organisation was also shortlisted as a finalist in the ‘Large Employer of the Year’ category, and UKHO HR apprentice, Melanie Crysell, was nominated for ‘Higher Apprentice of the Year’. It is great to see the hard work done by our apprentices and the wider team at the UKHO being recognised within the county. A huge congratulations to Sophie – I felt very proud reading and seeing her achievements being recognised in a very public forum. Since joining the UKHO on an internship in 2016, Sophie has secured two promotions – most recently to the role of Digital Marketing Communications Executive. She is studying for a Digital Marketer apprenticeship and is one of over 50 apprentices across the organisation. The UKHO has offered an apprenticeship programme since 2016, offering the opportunity to study towards an industry-recognised qualification at advanced and higher levels across 15 different disciplines. Following this success, Sophie was also invited to a celebration lunch in the presence of Her Majesty The Queen, as part of her visit to Somerset on 28 March. She was invited alongside 100 other guests from across the county to King’s Bruton School, where the Queen opened the school’s music centre and named a new Avon and Somerset Police horse during her visit.